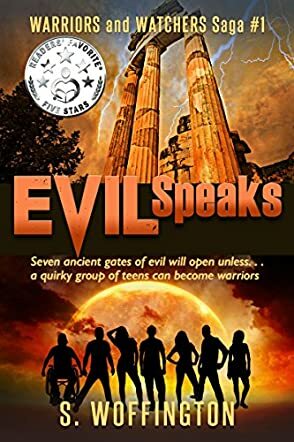 Evil Speaks by S. Woffington is Volume 1 of the Warriors and Watchers Saga. Benny is fifteen years old and has moved to a new place often. Each move is a new life and, on his seventh life, he decides that he is going to run away. His mother is paranoid and has been moving herself and Benny around for years, ever since his father disappeared when he was just three years old. Benny can’t remember it though; all he remembers is strange dreams of a dragon and a firestorm. He packs his bags after a fight with his mother and, all of a sudden, the house explodes. Benny finds himself in a strange world, uniting him with six teenagers that he thinks he remembers. On the day Benny’s father disappeared, all six lost their mothers and this unites them to find out what happened, following the one and only clue they have – Domenico H. Adez, Benny’s dangerous grandfather. Evil Speaks: Warriors and Watchers Saga Volume 1 by S. Woffington is an incredibly different kind of story. It is a very involved plot, but in a way that young adults will find easy to follow. This is a fast moving story with plenty of action that is more than just a mythological tale. It teaches young adults of the importance of working together, of being a part of a team to achieve results. The first books in a series are always the hardest in my opinion because they have to set the scene for the following books. This has been achieved admirably here with plenty of character background that will make the next book easier to grasp. I highly recommend this to any young adult with an interest in mythology.